Vitamins... most of us take them everyday, so should our dogs! Most of us take at least a one-a-day vitamin, but we often fail to realize that our furry family members would benefit from taking one as well. We take very good care of ourselves, we take our vitamins, and eat a variety of foods every day to give our body the nutrients it needs to be healthy. Our dogs rely on us, to feed them, and care for them, they cannot choose what they want and need to eat and buy it. Sadly, the majority of dogs are not receiving a complete, healthy diet, and many become ill and die prematurely. Have you noticed the amount of dogs coming down with cancer? We love our dogs, and we know that you love yours too! If we take vitamins, we should do the same for our dogs, it's that simple. With that being said, like the dog foods out there, not all vitamins are equal. I wanted a vitamin that I could give my dogs without worrying about the quality of the ingredients or where it was made. I searched and I finally found a vitamin that I felt comfortable giving my dogs, and that vitamin is NuVet Plus. NuVet Plus provides the very best human-grade, natural ingredients available, that is very important to me and that is why I'm recommending it to you and why I trust it with my dogs! 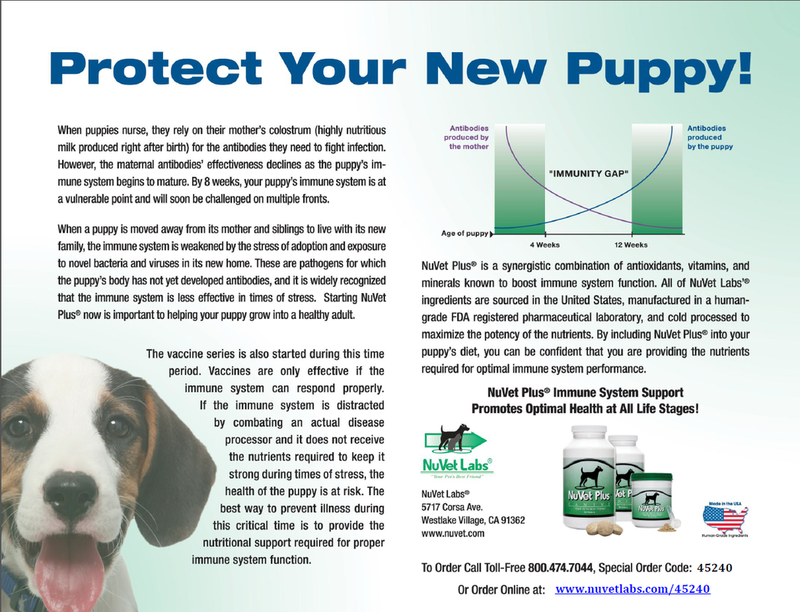 NuVet Plus: Natural, Powerful, Immune System Support! NuVet Plus is Veterinarian Recommended and Scientifically Formulated to Provide Everything Your Pet Needs for Optimal Health! Thousands of the nation's top veterinarians and other pet industry professionals use NuVet Plus® for their own pets, and recommend it to their clients' pets! NuVet Plus® is Natural- No Artificial Sweeteners or Fillers, that was very important to me. It has a taste that my pets love! It's made with Real Chicken Liver. It provides the very best human-grade, natural ingredients available, and utilize the latest advances in medical, veterinary, and nutritional science. 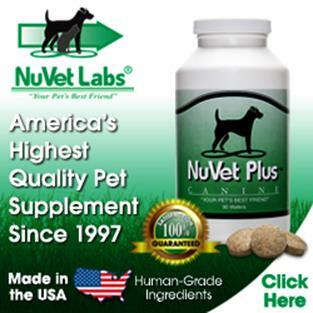 NuVet Labs' Goal is to help increase your pets' Longevity and Quality of Life. Their products help put pets on the path to perfect health and support their development through every stage in life. NuVet Plus is not available in stores or directly to the general public. Only Veterinarians and other pet professionals can refer you and supply you with the referral code needed to purchase these vitamins. It's similar to being a member at a whole sale club like Sam's or Costco. I feel so strongly about these vitamins, that I am sharing their information with you! Insider's Secret: NuVet products are distributed through educated and dedicated pet industry specialists. You can order directly from the manufacturer with a referral code. I will provide you with the information you need below. NuVet Labs toll-free number is 1-800-474-7044 if you would prefer to speak to a live person rather than ordering online. To order by phone just call 1 (800) 474-7044 and use order code 45240. 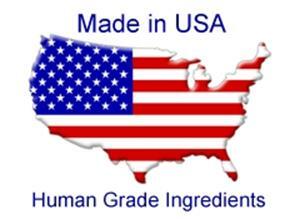 Please Click on the Flag to open up the next page to view and read about the ingredients in NuVet Plus! Need More Reasons Why You Should Choose NuVet Plus? Saving JUST ONE major trip to the vet could pay for more than a lifetime supply of NuVet Plus! You can keep your pet healthy for as little as 52 cents a day!